The video starts off introducing you to AutoCAD LT. This gives you a chance to get familiar with your surroundings in the program. 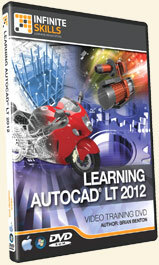 Chapter two takes a look at the new features that are in AutoCAD LT 2012. From there we systematically go through the many commands, tools, and features in the program. The video is set up for beginners. It assumes you have never used AutoCAD or AutoCAD LT, ever. If you have used it briefly, or it has been a while, then this video will also help you out. It will be a great refresher for what you forgot and will reinforce the skills you already have. The video is available on DVD-rom and as a digital download. Try it before you buy it. On the product page there are over 20 free videos from the training video itself. This will give you a great idea of the style of the content and how the information is presented. Learn AutoCAD LT 2012 from a professional trainer from your own desk. All InfiniteSkills Training DVDs come with a 100% money back guarantee. If your not happy with your Training DVD just contact the sales department within 30 days of purchase for a refund. If you have any questions about this title please feel free to contact me.